If you believe that God made Adam a farmer and a naked cave man, then you are completely mistaken! The creation of man, and his authority over ALL the earth, was greater and much further reaching than religious tradition has ever realized or accepted. 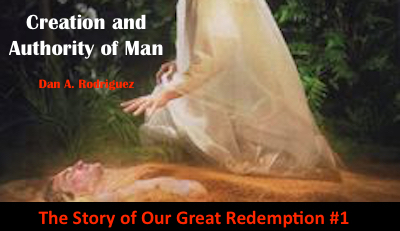 This first podcast in the series "The Story of Our Great Redemption" sets the stage for the greatest story ever told. Nothing compares to the story of our redemption. God's plan through the birth, death, and resurrection of Jesus makes the stories of man-made heroes pale in comparison. Jesus was, AND IS, the greatest hero the universe and eternity have ever seen! Nothing even comes close! These short podcasts are mostly under ten minutes each. Some are as short as five minutes. They are little podcasts with BIG revelation in them. I will be publishing about two per week because there are 50+ podcasts in this series. This series is based on my book with the same name, but I include additional information and revelation in the podcasts that was not in my book. You can download the book in PDF free of charge on my Published books page. You will be mightily blessed throughout this series! Don't miss even one, and please forward the messages to your friends, acquaintances, and family. Spread the Word!